The pantry is a ministry of North Lake Presbyterian Church which opened in 1998. Our supplemental grocery program for local families in need, improves their quality of life, helps sustain health, good nutrition, energy, human dignity and the opportunity for family members to meet their full potential. Hurricane Irma took it's toll on the Lady Lake area, leaving the pantry without power for a full week. Without any power, we were forced to close. During that time we unfortunately lost all perishable goods in our freezers and refrigerators. Thanks to our generous community, we did have reserve funds to continue to provide frozen meat to our clients. Plans are in place to look into generators to at least keep lights and some cold storage capacity up and running should there be the need in the future. God blesses our pantry daily! Even with this little setback, we assisted 309 families during the month of September. To date this year we have provided 3,119 families with over 9,000 bags of groceries! Now, it is time to collect for our Thanksgiving and Christmas Basket donations. Each year we provide Turkeys or Hams and all the fixings to our families for Thanksgiving and Christmas. You may help by donating any of the following items by November 1st or December 1st respectively. The week prior to the holiday, we can also accept fresh potatoes, sweet potatoes etc. Thank you in advance for your continued support of the Christian Food Pantry. You are indeed a blessing to many in need. When families fall on hard times touch choices have to be made. 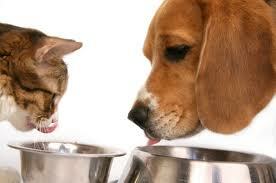 Often the choice is between taking care of necessities and caring for the beloved family pet. The Christian Food Pantry tries to help families keep their pets by providing pet food for Dogs and Cats. Your help with these items or Cash Donations is greatly appreciated. Directions: The pantry is located on East Lady Lake Blvd. just off highway 27/441 in Lady Lake.